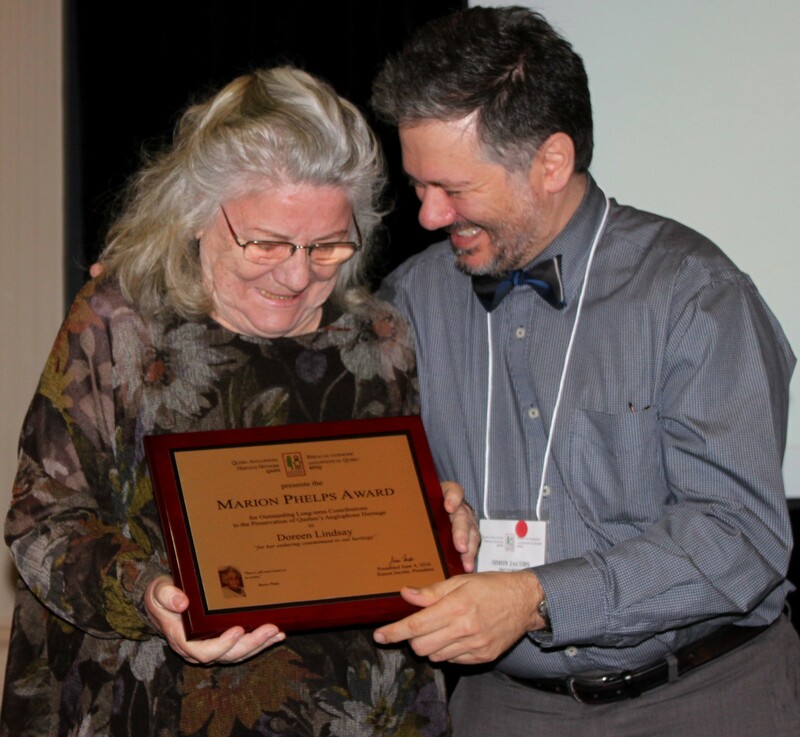 The Marion Phelps Award is presented annually by the Quebec Anglophone Heritage Network (QAHN) in recognition of outstanding long-term contributions by an individual to the preservation and promotion of Anglophone heritage in the province of Quebec. At its 16th annual convention, held in Sherbrooke, Quebec, June 2-4, QAHN presented this prestigious award to Doreen Lindsay, a leading light at the Westmount Historical Association. Doreen Lindsay has been active on the board of the WHA for more than 20 years, and has served as its president for the last 13 of them. She has devoted herself almost full-time to promoting awareness of local heritage, and has significantly raised the profile of the Association within the Westmount community. She has spent countless hours on historical documentation and research, and worked particularly hard to sensitize citizens to the importance of preserving Westmount’s unique architectural heritage. Among the many initiatives Doreen has undertaken for the organization are the following: the development of a lecture series; the design, writing and editing of a newsletter, The Westmount Historian; the inauguration of City of Westmount walking tours; the mounting of exhibitions of archival materials; and the contribution of historical-themed articles for the local weekly newspaper, the Westmount Independent. In this, her last year as president of the WHA, Doreen has been involved with QAHN's Housewife Heroines project, interviewing older Westmount women for their memories of the war years, and has written an article for Quebec Heritage News magazine on the topic. She has created and mounted a show of archival photographs for a local café, and has worked with a committee of the City of Westmount in planning an exhibition of architectural photos for its centenary celebrations. All of this in addition to the activities she regularly undertakes for the Association! Doreen’s energy and commitment, and her tireless efforts to preserve local heritage and expand knowledge of Westmount’s history, exemplify the spirit in which the Marion Phelps Award was established and make her an eminently worthy recipient for 2016. In her acceptance speech for the award, Lindsay said that she was "pleased and very grateful for the recognition." She thanked QAHN for the honour, as well as her family who had been very supportive of her volunteer efforts over the years. She also thanked the dozen or so Westmounters who had accompanied her to Sherbrooke to watch her receive her award, and to cheer her on.